15 applications I always had on my Windows computer. Open Office - is the leading open-source office software suite for word processing, spreadsheets, presentations, graphics, databases and more. 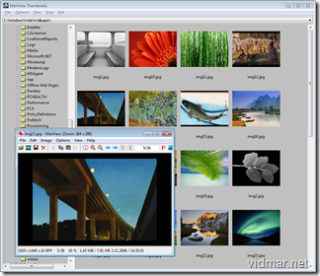 IrfanView - is a very fast, small, compact and innovative freeware (for non-commercial use) graphic viewer for Windows 9x/ME/NT/2000/XP/2003/Vista. GIMP - is the GNU Image Manipulation Program. It is a freely distributed piece of software for such tasks as photo retouching, image composition and image authoring. It works on many operating systems, in many languages. AVG Antivirus - offers basic antivirus and antispyware protection for Windows available to download for free. Limited features, no support, for private and non-commercial use only. Spybot-S&D - detects and removes spyware. It can also clean usage tracks, an interesting function if you share your computer with other users and don’t want them to see what you have been working on. And for professional users, Spybot-S&D allows you to fix some registry inconsistencies and extended reports. CCleaner - a freeware system optimization and privacy tool. It removes unused files from your system - allowing Windows to run faster and freeing up valuable hard disk space. Process Explorer - The unique capabilities of Process Explorer make it useful for tracking down DLL-version problems or handle leaks, and provide insight into the way Windows and applications work. IZArc -the ultimate freeware archive utility supporting many archive formats like: 7-ZIP, A, ACE, ARC, ARJ, B64, BH, BIN, BZ2, BZA, C2D, CAB, CDI, CPIO, DEB, ENC, GCA, GZ, GZA, HA, IMG, ISO, JAR, LHA, LIB, LZH, MDF, MBF, MIM, NRG, PAK, PDI, PK3, RAR, RPM, TAR, TAZ, TBZ, TGZ, TZ, UUE, WAR, XXE, YZ1, Z, ZIP, ZOO. PuTTY - a client program for the SSH, Telnet and Rlogin network protocols. VLC media player - a highly portable multimedia player for various audio and video formats (MPEG-1, MPEG-2, MPEG-4, DivX, mp3, ogg, …) as well as DVDs, VCDs, and various streaming protocols. CCCP - the full title is the Combined Community Codec Pack. Actually, it’s more like a filter pack than a codec pack but filter doesn’t begin with C and the authors wanted a good acronym. Firefox is created by an international movement of thousands, only a small percentage of whom are actual employees. Notepad++ - a free source code editor and Notepad replacement, which supports several programming languages, running under the MS Windows environment.